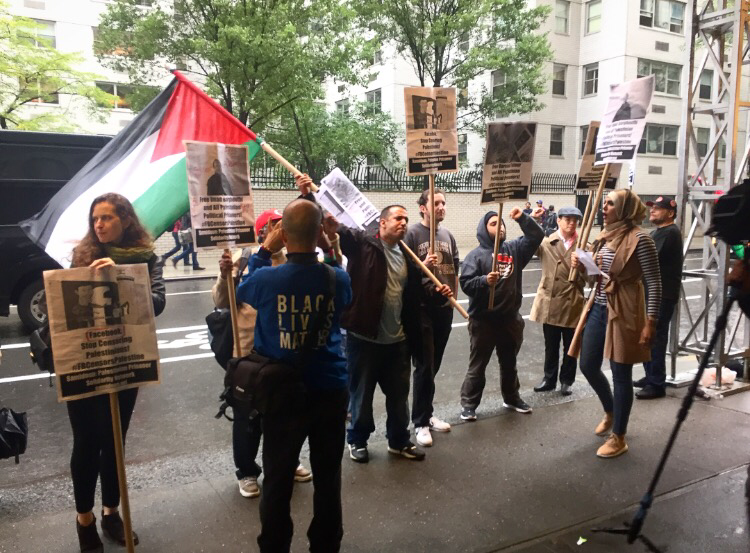 Despite the constant heavy rain, nearly two dozen protesters showed up to the event, organized by the Samidoun Palestinian Political Prisoner Solidarity Network and NYC Students for Justice in Palestine. 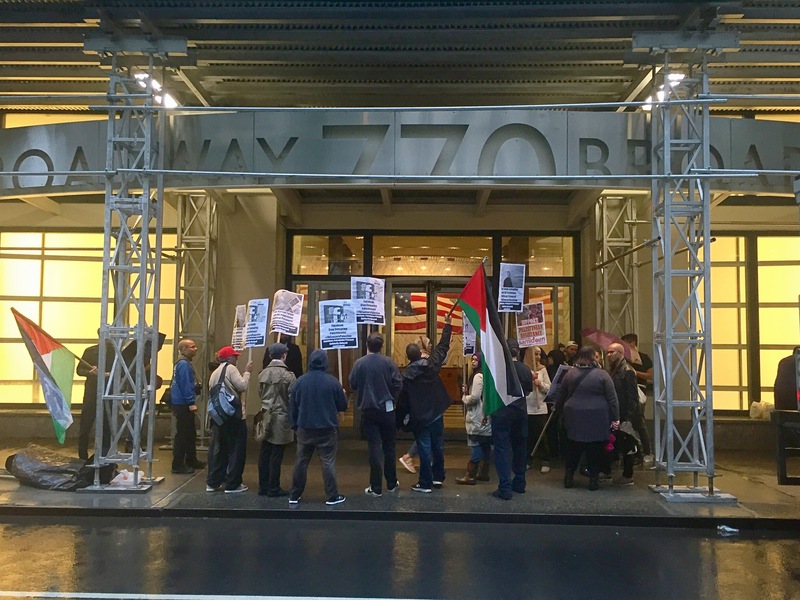 “We’re here today in solidarity with Palestinians who have been protesting Israel’s new agreement with Facebook, as well as its deletion of Palestinian content, which has been an ongoing problem for years,” Joe Catron, one of the event’s organizers, told me. As Alex Kane reported in The Intercept in June, Israel has been aggressively monitoring the content of Facebook posts by Palestinians. Human rights groups have documented that as many as 400 Palestinians have been arrested in the past year for the content of their social media posts. 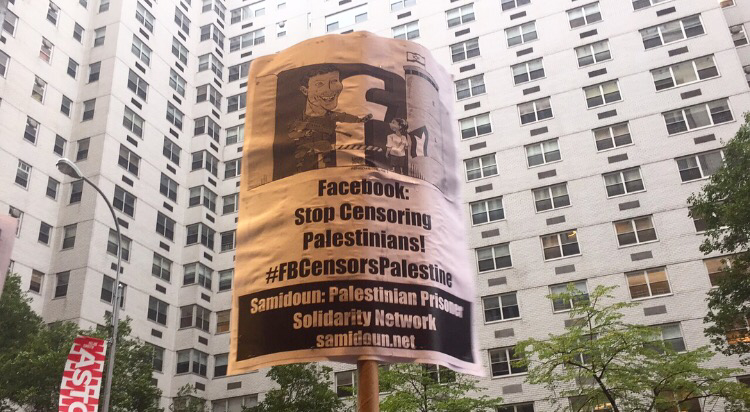 “This is a brutally effective form of censorship in the Middle East, where online communication is a popular organizing tool that’s generally seen as independent of government interference,” a Huffington Post reporter wrote. In 2014, thousands of Israelis used Facebook to post messages “calling for the murder of Palestinians.” When an IDF occupying soldier was arrested for shooting and killing a wounded Palestinian point blank in the head last year, IDF soldiers used Facebook to praise the killing and justify that violence, with online Israeli mobs gathering in support. According to Israel’s Minister of Justice, Ayelet Shaked – who, ironically enough in a now-deleted genocidal Facebook post, called for the slaughter of Palestinian mothers who give birth to “little snakes” a day before six Israelis kidnapped and burned alive Palestinian teenager Muhammad Abu Khudai – Facebook has granted 95 percent of Israel’s 158 requests to remove content in the last four months. More than a week after the AP report, the Electronic Intifada reported that Facebook, undoubtedly a hugely influential force in journalism, had deleted the accounts of editors at two prominent Palestinian publications. “We believe this is the result of the agreement between Israel and Facebook. It is very strange that Facebook would take part in such an agreement, given that it is supposed to be a platform for free expression and journalism,” one of the newspapers said. The next day, Facebook admitted the editors’ accounts were deleted in error. “Facebook is a private company, with a legal obligation to maximize profit, and so it will interpret very slippery concepts such as ‘hate speech’ and ‘inciting violence’ to please those who wield the greatest power,” Greenwald wrote. The protest outside Facebook’s office lasted from 4 p.m. to about 6:30 p.m.
See my coverage of the protest on Periscope here. What type of investigation did the FBI conduct into Ahmad Khan Rahami? The FBI conducted a preliminary investigation into Rahami after his father contacted them following a 2014 stabbing to express concerns that his son was a terrorist. …The FBI did not clarify if it interviewed Rahami, who was captured in a shootout with police yesterday, in 2014, but confirmed it conducted a preliminary investigation. The information was passed to the Joint Terrorism Task Force led by F.B.I. in Newark. Officers opened what is known as an assessment, the most basic of F.B.I. investigations, and interviewed the father multiple times. …The assessment of Mr. Rahami illustrates the challenges the F.B.I. faces as it solicits information from the public about people who might pose a threat and then must sort through what is credible, while balancing the need to protect the country without overstepping its authority. …Like Mr. Rahami, one of the Boston bombers, Tamerlan Tsarnaev, was the subject of an assessment in 2011. Depending on the intensity and urgency of an inquiry, there are three types of investigations the F.B.I. can undertake with varying levels of intrusive techniques. The first is an assessment, in which agents use basic techniques like conducting interviews, talking to confidential informers, using physical surveillance and checking databases and public records. Next come preliminary and full investigations, which can be initiated if agents believe a federal crime has been committed or there is a threat to national security. Those investigations can involve polygraphs, undercover agents and mail searches. Both assessments and preliminary inquiries have time limits. A full investigation has no such time limits, but does eventually require review and employs powerful electronic surveillance tools, requiring the approval of a court warrant. Among other things, it allows for the secret interception of international communications. Unless The Guardian knows something I don’t, it’s likely that it simply didn’t consider the real differences between “assessment” and “preliminary investigation.” The distinction seems rather harmless, but nonetheless important to point out.